Usually the movies that I choose to watch are heavily dependent on the cast. If the cast is good, I would definitely watch the movie. 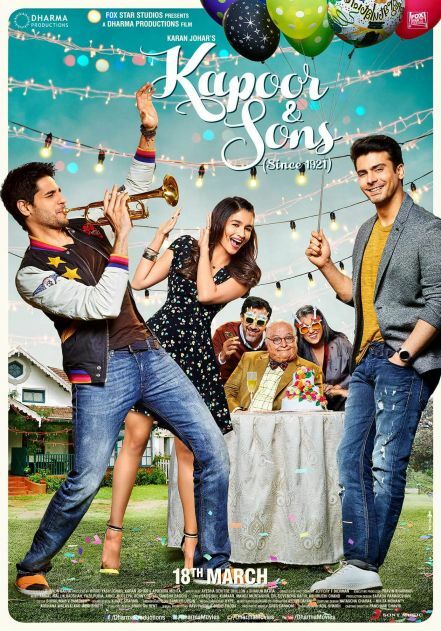 Fawad Khan starrer Kapoor & Sons (Since 1921) was impossible to miss! I had also watched Khoobsurat because of him and in Khoobsurat the only good thing was Fawad. But in Kapoor & Sons, though I was mentally prepared to admire only him, I was pleasantly surprised that the movie has a lot more to offer than just a gorgeous man. Fawad Khan blends in so well with the story and the cast and that he does not stand out. 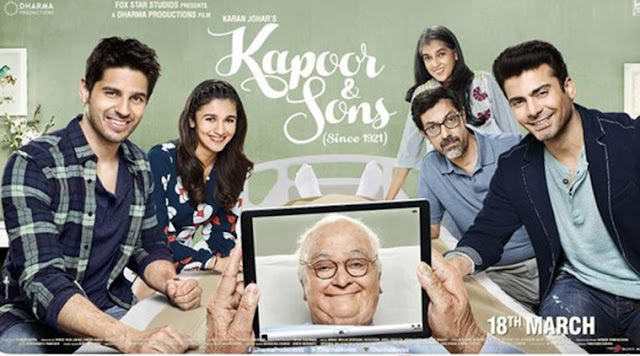 Imagine, how amazingly the whole movie is directed and shot that Fawad Khan, till the end, remains just the older son of Kapoor family. Nothing more, nothing less! I loved every role in the movie. Each perfectly fitting the story. Rishi Kapoor's role as the grandfather of the family is so natural and yet absolutely hilarious that you will laugh each time he comes on screen. Rajat Kapoor, as the father of Fawad Khan Aka Rahul Kapoor and Sidharth Malhotra aka Arjun Kapoor has also performed brilliantly. Ratna Patak as the mother and Alia Bhatt as Tia also have given equally strong performances as per the demands of their roles. The production design is outclass with every little detail well taken care of. The beauty of the movie lies in the fact that the movie would not have been possible without any of these characters. Nothing and no one, not even the dog seems extra. In the beginning I felt the movie was a bit slow but when the stories unfold you do realize how the writer and director were giving you clues slowly and preparing you for the roller coaster ride later in the movie. Each puzzle in the movie fits in the end and there no loop holes. I love it when movies are complete. Karan Johar is great as usual but a special shout out to writer, Shakun Batra, who has done an outclass job especially keeping in mind that this was only his second movie. I do not want to give away the story but this movie revolves around one family and their demons that they are living with. It is not a typical love triangle chick flick. The movie highlights the sad reality of how families these days expect perfection and how much pressure one takes to fulfill those expectations. When families should be forgiving and accepting and be a warm shelter where everyone can talk about their fears. After a long time, I am giving 5 stars to this movie and I'd just say...Don't miss it! Hahahaha .. You can, you can!!! finally!